My husband George Schmidt and I are going to keep our son Sam (a ten-year-old fifth grader at O.A. Thorp Scholastic Academy in Chicago) home during ISAT testing this week and next week. The tests for fifth grade include three tests of reading and three tests of math. According to the Illinois State Board of Education Administrative Code, the ISAT is a requirement for most Illinois public school children. However, when children miss the tests they simply don't have test scores for that year. Promotion to the sixth grade in the Chicago public schools is not contingent on ISAT test scores. O. 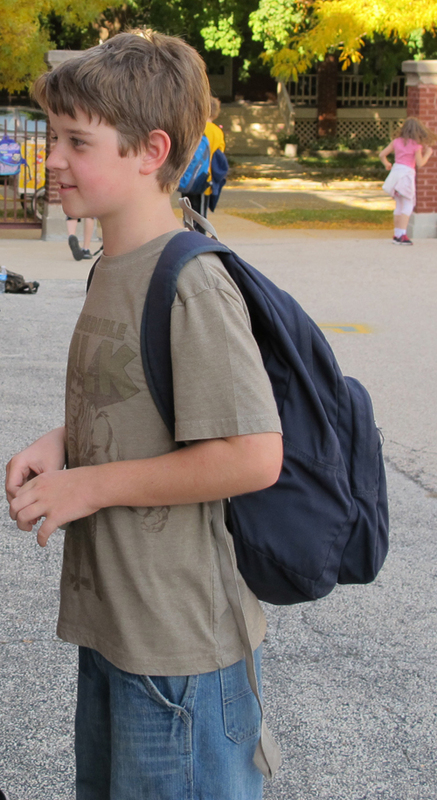 A. Thorp fifth grader Sam Schmidt will skip the ISAT this year. Instead of staying at school and reading a book (the way he does when skipping other standardized tests like the Scantron Performance Series and the pilot Common Core tests) Sam will have to stay home during the ISAT tests. Substance photo by Sharon Schmidt. I talked to Sam's teacher on March 1 and told her Sam would not be testing. The next day I sent an email to O. A. Thorp principal Kathleen Bandolik informing her of the same. "Dear Ms. Bandolik, George and I have decided to opt out Sam from the ISAT testing this year. It seems like the best way to handle this is to bring him to school on the test days after the test time is over. Wednesday, 3/7: 5th grade testing finished at 9:15; Thursday, 3/8: 10:15; Friday, 3/9: 10:15; Tuesday, 3/13: 9:15; If you would like to talk more about this, I'll be available after 2:30 today at 773-401-6201. If you would like me to compose a more formal letter regarding our choice (similar to other letters we have written about opting out of the other tests), I'd be happy to do so. I'm sorry if our decision to exclude Sam from the ISAT will cause you or Ms. Lah any headaches. You know we are so happy about the experience both Sam and Josh receive at Thorp. It's the overuse of standardized testing and the misuse of the test scores by CPS that we dislike. Sincerely, Sharon Schmidt." Principal Bandolik forwarded my email to two people, Anna M. Alvarado, Deputy Chief of Schools, and MahRukh Mian, Family and Community Engagement manager, both of the "O'Hare Elementary Network" -- to which Thorp belongs. After reading the correspondence, I emailed Ms. Alvardo and Ms. Kamberos and asked for a copy of the "state mandate." http://www.isbe.net/rules/archive/pdfs/oneark.pdf See information at the bottom of this article from those sections of Illinois Administrative Code. Shortly after these emails were sent I received a phone call from Tony Howard, CPS director of policies and procedures. Ms. Kamberos had forwarded my email to him. The school will mark Sam tardy, or a half-day absent, or a full day absent, depending on the time he misses from school. According to the ISBE Administrative Code, schools need a 95 percent compliance rate on state tests (see information at the bottom of this article). When I spoke with Sam's teacher Carrie Lah on March 1, I told her I hoped our decision would not cause her any problems. Because we've had several conversations, she knows why we keep Sam out of standardized testing. The first page of the March 25, 2010, Chief Education Officer letter to the Schmidts. On page two, Barbara Eason-Watkins discusses excluding children from testing. For the past two years (since February 2010) George and I have opted Sam out of dozens of CPS standardized tests, per CPS policy. Sam has remained in school (reading a book of his choice in the office, hallway, or classroom) while his class took tests. Sam has skipped the tri-yearly CPS Learning First Reading and Math Benchmark Assessments, the tri-yearly reading and math (and science in 4th grade) Scantron Performance Series tests, and the quarterly pilot Common Core reading and math assessments. In addition, in the 4th grade, we opted him out of a University of Chicago science curriculum research project that included several pre-, during-, and post-study assessments. After I went to the Board of Education in March 2011 to request that CPS make its opt out policy clearer for parents "such as putting it on its assessment website," I received a letter from CPS law department administrator Phillip Rocks saying CPS was looking into the issue. In her final paragraph, Eason Watkins notes that when parents choose to exclude their children from testing the children will be asked to "engage in a silent, self-guided activity." Most children who sit out the excessive CPS tests read books of their choice.In the meantime, parent choice to opt out of excessive, experimental CPS tests is and has been a policy for several years. 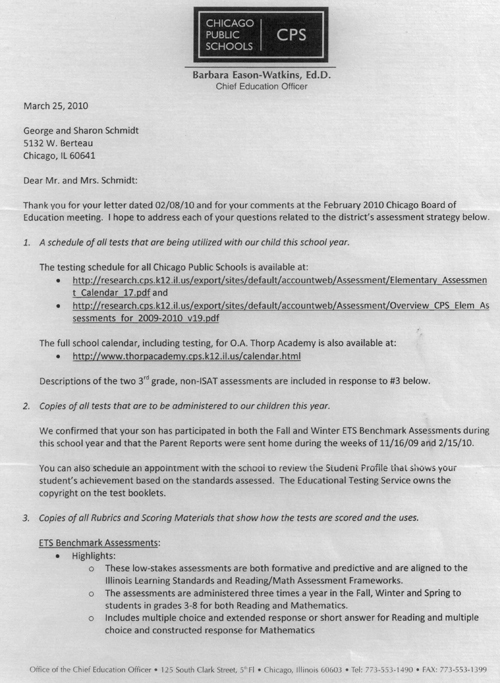 The Chief Education Officer of the Chicago public schools (at that time, Barbara Eason-Watkins) explained the policy in a 2010 letter addressed to me and George Schmidt after I had requested the information at the February 2010 Board of Education meeting. 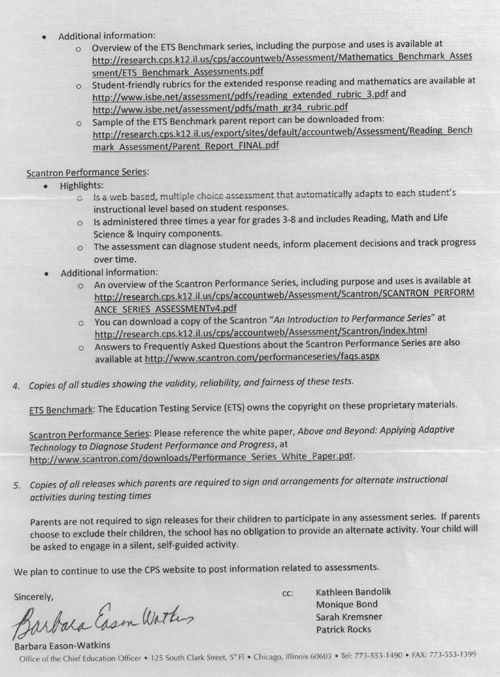 In her second to last paragraph on page two, Ms. Eason-Watkins acknowledges parents' choice to exclude their children from standardized tests (referring to them as "assessment series" and explains the procedure for children remaining in school during testing. "Parents are not required to sign releases for their children to participate in any assessment series. If parents choose to exclude their children, the school has no obligation to provide an alternate activity. Children will be asked to engage in a silent, self-guided." Other parents have used this letter to help communicate with principals their rights to opt out their children. Rearranging our schedule to keep Sam home from the ISAT is more difficult for us and disruptive for him than it would be if he could just opt out at school and read during the test as usual. The Chicago Teachers Union testing committee (this reporter is the chair person) and the CTU parent and community partners will be working toward getting parent opt out legislation in Illinois. Testing limitation legislation and testing transparency legislation are also goals. The State Superintendent of Education shall develop and administer assessment instruments and other procedures in accordance with Section 2-3.64 of the School Code [105 ILCS 5/2-3.64]. In addition, school districts shall collaborate with the State Superintendent in the design and implementation of special studies. 2)	Districts shall participate in special studies, tryouts, and/or pilot testing of these assessment procedures and instruments when one or more schools in the district are selected to do so by the State Superintendent. 3)	A school shall generally be selected for participation in these special studies, tryouts, and/or pilot testing no more than once every four years, except that participation may be required twice every four years in the case of the Illinois Alternate Assessment. 4)	All pupils enrolled in a public or State-operated elementary school, secondary school, or cooperative or joint agreement with a governing body or board of control, a charter school operating in compliance with the Charter Schools Law [105 ILCS 5/Art. 27A], a school operated by a regional office of education under Section 13A-3 of the School Code [105 ILCS 5/13A-3], or a public school administered by a local public agency or the Department of Human Services shall be required to participate in the State assessment, whether by taking the regular assessment, with or without accommodations, or by participating in an alternate form of the assessment (Sections 2-3.25a and 2-3.64 of the School Code).